During his time in Neunen between 1883 and 1885 Van Gogh focused on a study of rural life in the Brabant region. He also executed a number of landscapes that clearly reveal the influence of 17th–century Dutch painting and the Barbizon School. Watermill at Gennep is one of those works. Its large format and the fact that it was entirely painted outdoors in the cold month of November 1884 represented a challenge to the painter. The emphasis on backlighting recalls the work of Jules Dupré and suggests deliberate imitation of his style, together with that of Daubigny, who had exhibited a 2 x 1 metre canvas at the 1864 Salon that had also been painted outdoors. However, there are also marked differences between the two artists. In contrast to Daubigny’s tonal painting, Van Gogh here tries out pure touches of colour for the first time, bringing him closer to Impressionism and heralding his mature style. With its generous panoramic shape of one metre and a half, this painting is by far the largest of a group of works representing watermills that Van Gogh made in 1884. Its unusual shape may have been inspired by a decorative series representing the "Four Seasons" that was meant for Antoon Hermans new residence at Eindhoven. All these watermills were in walking distance from his parental home in Nuenen, near Eindhoven. This water-mill with its two wheels can be identified with the water-mill at Gennep in the river Dommel. The wooden structures are the mill proper; behind it a farmhouse can be seen that also contained the home of the millner. Marc Edo Tralbaut identified the mill and reproduced several photographs made in situ. Van Gogh´s authorship can be conferred from several primary and secondary sources. In a letter to be dated in the third week of November, Van Gogh wrote: "These days I am still working outdoors, although it is freezing considerably here. I am working on a rather large study (more than one metre) of an old water mill at Gennep [letter to his brother Theo, November 1884], on the other side of Eindhoven. I want to finish this work completely outdoors-but it will surely be the last work that I have done outside this year." The letter, and therefore this painting, can be dated to the third week of November, since the temperature began to drop below zero in this week. When Van Gogh carried the large study home, it attracted someone's curiosity: "Yesterday I just brought home that study of the water mill at Gennep, which I painted with pleasure. It has brought me a new friend in Eindhoven. He wanted to learn to paint at all costs, so I visited him and we started immediately." This pupil was Anton Kerssemakers, who later remembered to have seen Vincent at work on this painting. Kerssemakers told that Van Gogh used copaiva balsam, a substance used in oil painting to inhibit the drying process of the paint, permitting a longer working process. According to Kerssemakers, he used it too generously: "the sky in the painting melted down, so he had to scratch it off with a palet knife and repaint it." This would still be visible when on careful inspection. Indeed, if one looks at the water on the right, there is a blueish reflection of the sky and near the wheel, a little blue is still visible. Probably, the grey clouds were an afterthought. 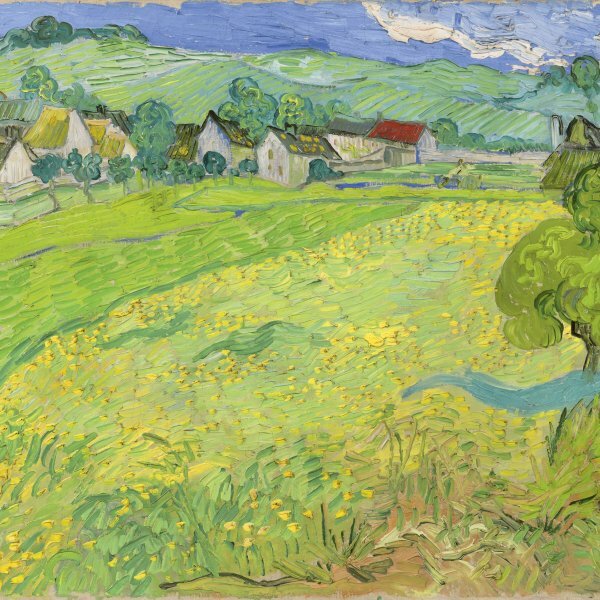 Kerssemaker's observations are the more remarkable since it is the relationship between the bright but overcast sky and the darker mass of the river and the houses that is exploited by Van Gogh with great aesthetic success. 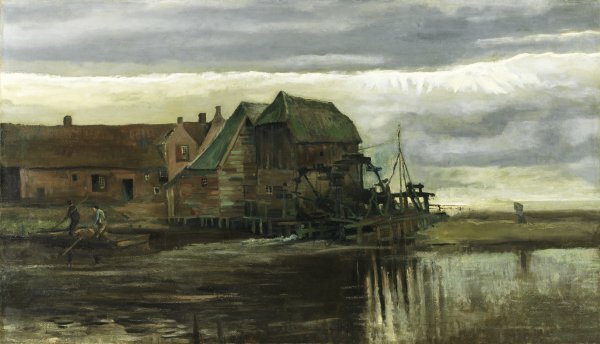 His brother Theo had reproached him that he painted too darkly and Vincent felt that in this painting of the Gennep mill, he had "made progress in painting technique and colouring." The dark masses of the water and the houses are treated with varied colours; red and blue touches create a lively effect of space and light. A rim of pale sunlit clouds under a dark zone reinforces the strong horizontal effect of the composition. A little to the right over the mill, sunrays are piercing the clouds and the light falls on the water behind the wheel. These bright spots in the painting create strong vertical reflections in the river in the foreground, thus providing a dramatic counterpoint to its horizontal structure. At the left, he made the dark, enclosed space vivid through colour contrasts; at the right the deep space is filled with direct lightfall. Similar effects were familiar to him from the work of the French landscape painter Jules Dupré, whom he admired. It seems that this magnificent contre-jour effect only came to the Van Gogh as he was forced to rework his painting. He was so much satisfied with the result, that he made a watercolour copy of it (F1144a; JH 523, present location unknown). In the watercolour, the light contrasts seem to have been reinforced. Annet Tellegen has ascribed another watercolour representing almost the same view to Anton Kerssemakers.